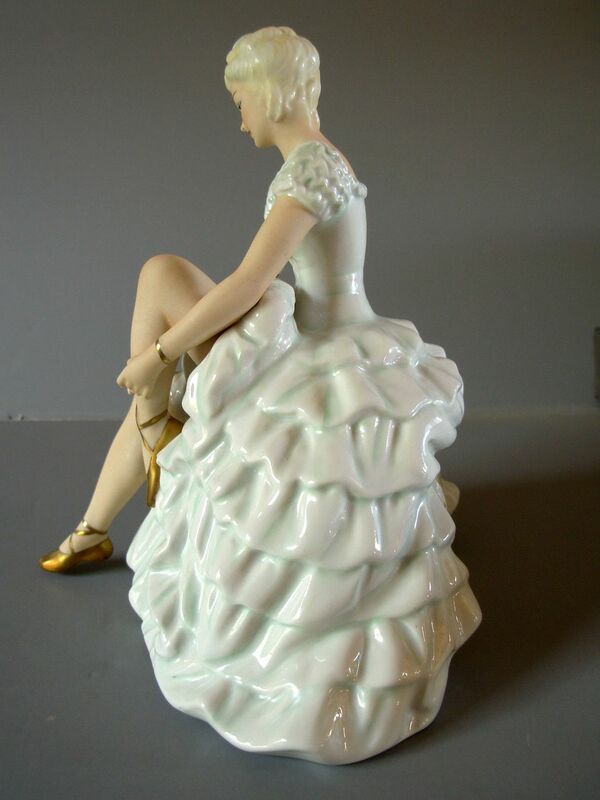 This elegant German porcelain dancer is seated on a graceful bench adjusting her slipper. Her dress is layers of exuberant ruffles. She is wearing gold slippers and her arm is adorned with gold bangles. Her face is serene and lovely. The base of this figurine is marked SchauBach Kunst, Germany. She is dated around 1953 to 1958 and is in excellent condition. Her size is 7 inches tall x 6 1/2 inches wide x 5 1/2 deep. I bought her from Suzan Dentry Antiques at the online Ruby Lane store. See more of this Post for more beautiful photos. Wallendorfer Porzellan or Wallendorf Porcelain is a porcelain manufacturing company which has been in operation since 1764 in Lichte (Wallendorf) in the Thuringian Highlands or Forest, Germany. In 1932 Heinz Schaubach Kunst took control of the Wallendorf porcelain factory and re-named it Schaubach Art, also known as Porzellanfabrik Schaubach Kunst. In 1953 the German Democratic Republic nationalised his business and said it was the “property of the people”. Kunst left Germany and gifted a good friend, Franz Goebel, with the design of many of his creations. Goebel’s creations are marked with a picture of a bee in a V and the words “Schaubach Kunst” in a half a circle, according to the Goebel Collector’s Guide which is partly available on Google Books. Heinz Schaubach Kunst died in1970 and Goebel discontinued his line in 1975. 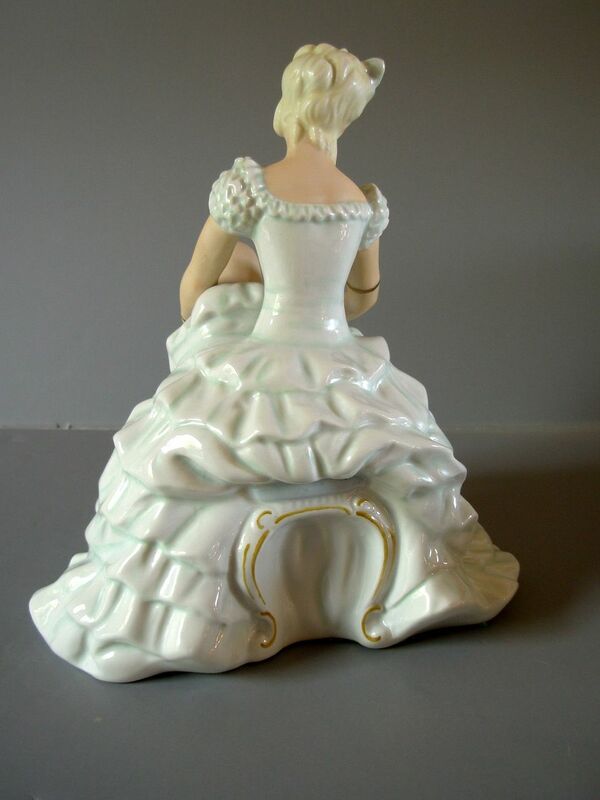 From 1953 until 1990 Wallendorf Porcelain traded as a publicly-owned enterprise under the name – VEB Schaubach Art Lichte-Wallendorf – however there were only very few of the known Wallendorf products being produced, and the range was reduced to a few figures as well as coffee and tea services. In 1990 the Factory was acquired by Erich J Bruckert, who holds it as a limited liability company. You can see a nice photo of the actual Wallendorf factory at the website of the current factory, now simply called “Wallendorf Porcelain”. Please also look at figurines by Schaubach Kunst and Goebel here, and manufactured by the original Wallendorf Factory. 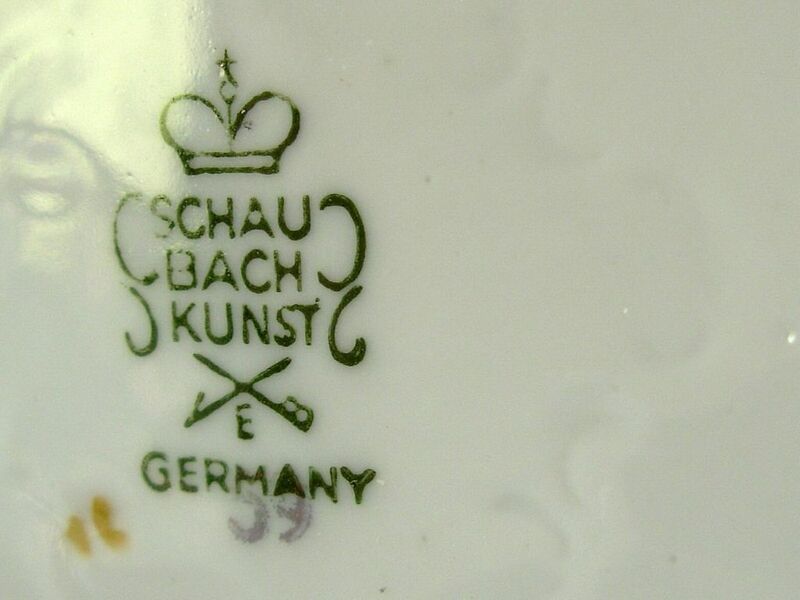 If you scroll down to the bottom of the page above and click on the flashing round purple dot, you will then be taken to a page showing the Trademarks of Schaubach Kunst and Goebel, and of the original Wallendorf Factory. Since 1963, the founding year of the Wallendorf Porcelain factory, 1794, has been used as the trademark, according to the current owner of the Wallendorf Porcelain factory. Also, you will see my Figurine in the very first section of the aforementioned web page ( by “ibdennis” ). I think that this shows that my beautiful figurine, which I am delighted with, is a Schaubach sculpted design produced by the VEB Schaubach Art Lichte-Wallendorf factory. Categories: Art, Beauty, Crafts, Culture, Figurines & Sculptures | Tags: ballerina figurine, dancer figurine, goebel, porcelain ballerina, porcelain dancer, schaubach kunst, Wallendorf | Permalink.